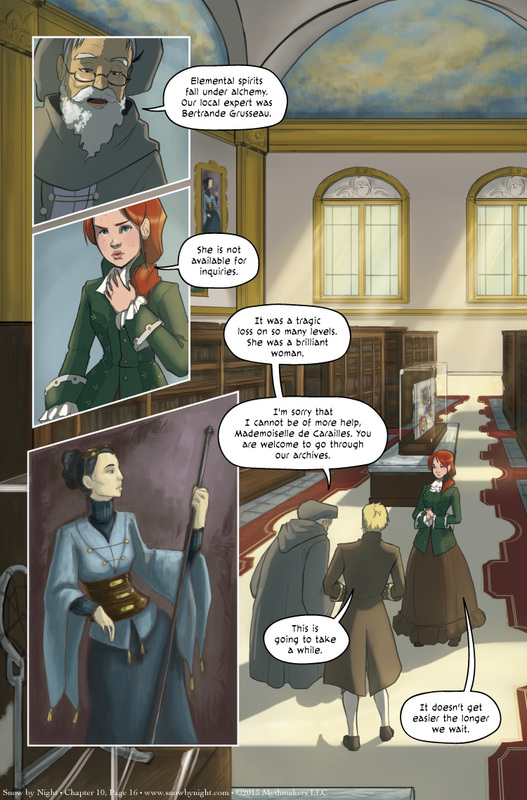 Antoine shows Vivienne and Jassart the archives on Chapter 10, Page 16. There are upsides and downsides to having a great spirit who is the patron of arts and sciences. On one hand the savants write down a lot of things; on the other hand, they write down a lot of things. To see what lies in store for Jassart and Vivienne on the next page, please vote for Snow by Night on Top Web Comics. In other news, Snow by Night will be joining the other creators of Reverie Comics at AwesomeCon! Come see us and say hello. We’ll be doing panels, selling books, and just talking with fans. Loving the euphemistic “she is not available for inquiries”. Brilliant political bafflegab, Vivienne.